TIPS Vendor Check-In kiosks provide secure, controlled, self-service access to online vendor credentialing validation services. DynaTouch can supply you with a secure, robust, self-service Internet kiosk solution that has already been approved to operate on government networks. 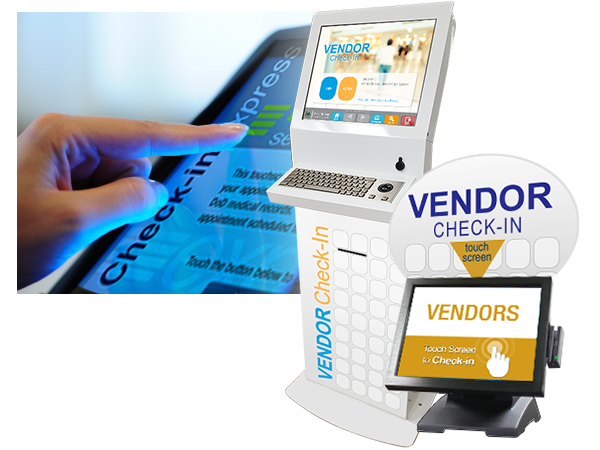 All TIPS Vendor Check-In Kiosks are fully compatible with any web-based vendor check-in application, with TIPS Kiosk Management Software™ at its core. Government-approved; compatible with Secure (formerly RepTrax), Vendormate, Symplr (formerly VCS), etc. When space permits, and ruggedness is important, you can choose from the following floor standing kiosk models. These models offer sleek looks, and include professionally designed graphics to attract your customers. Add further visual impact and select from our full range of custom overhead and panel signage options. When floor space is limited, countertop or wall-mounted kiosks are better solutions.